90% of the agreements were finalised using dematerialized SEPA direct debit, versus 75% for postal orders. 76% of the debtors contacted agreed to sign the on-line direct debit immediately. 5% of orders were rejected versus 16% for cheques. It takes seven minutes to sign the SEPA direct debit and take payment, compared to 17 days for the standard method. RecordSign is a legally binding electronic contract system, particularly useful for debt recovery. The debtors can be made aware of the debt, approve the payment schedule, and digitally sign the SEPA direct debit. The aim is to encourage an immediate settlement of the debt and to reduce the average debt collection time by converting promises of payment into secure, immediate, and dematerialised direct debit payments, in full compliance with legal requirements. Speed up your collection process, boost your productivity, save money ! Lors de l’appel téléphonique, le téléconseiller valide avec le débiteur la reconnaissance de la dette et l’échéancier de paiement. Le téléconseiller adresse par e-mail un lien vers l’espace sécurisé SEPA et un code d’authentification par SMS au débiteur. Le débiteur accède à son espace sécurisé, ce qui lui permet de saisir les données de prélèvement SEPA et de confirmer son accord par une signature numérique. Ensuite, l’accord est horodaté et archivé dans une caisse de dépôt numérique pour 10 à 20 ans. Notre tarification en modèle cloud est environ 30% moins chère. Pas de budget projet, un setup faible et un paiement selon le nombre de souscriptions. Mais toujours avec un prix fixe par souscription, permettant au métier de gérer son projet. During the telephone call, the sales agent confirms that the debtor acknowledges the debt and agrees the payment schedule with them. The sales agent emails a link to the SEPA secure site and sends an SMS authentication code to the debtor. The debtor goes to their secure area, following the link, where they can enter the SEPA direct debit information and sign their agreement digitally. Then the agreement is time-stamped and archived in a digital depository for a period of between 10 to 20 years. Our Cloud model pricing is about 30% cheaper. No project budget is necessary, there is a minimum setup time and the cost is based solely on the number of orders processed. There is a fixed cost per order, making it easy for the business to manage the project’s budget. The service's features are listed below. We are looking forward to starting a project with you ! Opportunity is ideally positioned to be your partner in this enterprise, to offer advice, support and project management assistance to help your business go fully digital. As a cutting-edge Customer Risk Management solution, debt collection in particular, this comprehensive and proactive tool makes it possible for you to simplify and optimise your customer contact campaigns in situations where there are customers with sums outstanding. The development of RFID and the increasing number of purchases made online increase the risk of credit card fraud. With Card Protect you can verify fraud alerts in real time without having to involve your support staff. Survey Design is a way to measure the level of customer satisfaction, which lets you develop and monitor your customer experience management strategies completely in-house. MyPersonalVideo is an innovative solution that enables you to send customised videos with high added value, in real time, to communicate with your customers in a uniquely individual and interactive way that will make your business stand out ! VideoSign is an engaging, real-time video streaming solution that will increase your sales by simplifying the purchasing process and reducing your acquisition costs. RecordSign is a legally binding on-line purchasing system, designed to encourage the customer to sign direct debit agreements on the spot and to reduce the average payment time. Que faites-vous le Jeudi 16 Novembre 2017 à 8H30 ? 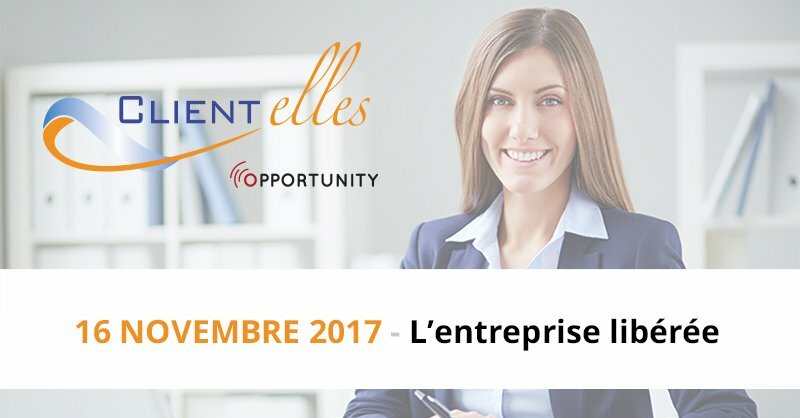 CLIENTelles a le privilège de recevoir Monsieur Christophe Collignon et vous invite à notre conférence du 16 novembre 2017 sur le thème de L’entreprise Libérée !